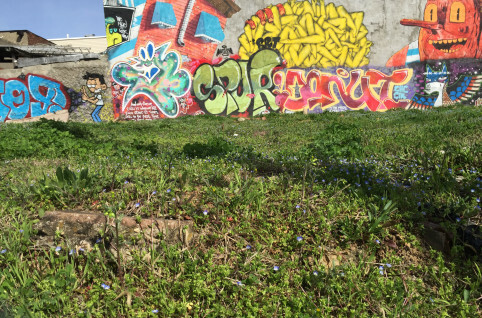 The Feral Landscape Lobby (FLL) is an informal, artist-run assemblage of ideas, interventions, experiences and spaces designed to advocate for urban weeds and their habitats. Among its activities, the lobby designates specific spaces where city dwellers can bear witness to untended nature at work in the fabric of urban life. Recasting vacant city lots and other undesigned open land as transitory zones for rewilding, the FLL emphasizes that these spaces are already functioning ecologically. If properly valued, preserved and stewarded, these ubiquitous “informal greenspaces” can provide a refuge and foothold for nonhuman life while also benefiting local human populations, both ecologically and culturally. The ultimate goal of the FLL is to create a permanent wild urban park. The projects linked below are steps along the way. They are designed to appreciate, commemorate and otherwise attend to the endangered weedy spaces of New York City.